Recent years have seen a substantial increase in alternative agrifood initiatives that attempt to use the market to curtail the negative social and environmental effects of production and trade in a globalized food system. These alternatives pose a challenge to capital accumulation and the externalization of environmental costs by large agribusiness, trading and retail firms. Yet the success of these alternatives also makes them an inviting target for corporate participation. 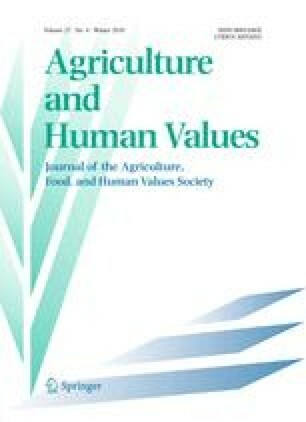 This article examines these dynamics through a case study of the two most significant such food system alternatives—organics and fair trade—focusing on corporate involvement in establishing and renegotiating the standards undergirding these initiatives. We compare the development of and contestation over the standards for both certified organic and certified fair trade, with particular attention to the U.S. context. We provide a brief history of their parallel processes of rapid growth and market mainstreaming. We examine claims of cooptation by movement participants, as well as the divergences and similarities between the organic and fair trade cases. Analyzing these two cases provides useful insights into the strategic approaches that corporate firms have deployed to further capital accumulation and to defuse threats to their profit margins and to status quo production, pricing, labor, trading and retailing practices. It can also offer valuable lessons regarding the most effective means of responding to such counter-reforms and of protecting or reasserting the more transformative elements at the heart of these alternative systems. Baden-Meyer, A. 2008. Testimony from the OCA to USDA on preserving organic standards and expanding organics. http://www.organicconsumers.org/articles/article_12488.cfm. Accessed 3 July 2008. Bahra, P. 2009. Tea workers still waiting to reap fairtrade benefits. The Times (UK), Jan 2. http://www.timesonline.co.uk/tol/news/uk/article5429888.ece. Accessed 23 Feb 2009. Cummins, R. 2002. Is USDA organic grade B organic? http://www.organicconsumers.org/organic/gradeb092902.cfm. Accessed 23 May 2008. Cummins, R., and A. Eidinger. 2006. USDA attempts to pack organic standards board with corporate agribusiness reps. http://www.organicconsumers.org/articles/article_3526.cfm. Accessed 2 Jul 2008. Eden Foods. 2006. Why Eden foods chooses not to use the USDA seal. Press Release, 19 June. http://www.edenfoods.com/articles/view.php?articles_id=78. Accessed 2 June 2008. Fair Trade Association of Australia and New Zealand (FTAANZ). 2007. FLO-Cert gets ISO 65 accreditation. http://www.fta.org.au/node/1962?PHPSESSID=36b08eead7ffffd51354237c180772fb. Accessed 10 Jan 2009. Fairtrade Labelling Organizations International (FLO). 2007a. Global fairtrade sales increase by 40%, benefiting 1.4 million farmers worldwide. http://www.fairtrade.net/single_view.html?cHash=b3703de592&tx_ttnews%5BbackPid%5D=168&tx_ttnews%5Btt_news%5D=26. Accessed 29 Jul 2008. Fairtrade Labelling Organizations International (FLO). 2007b. Final FLO governance structure. http://www.fairtrade.net/fileadmin/user_upload/content/Final_FLO_Governance_Structure.jpg. Accessed 2 Jul 2008. Fairtrade Labelling Organizations International (FLO). 2008a. FLO standards committee members. http://www.fairtrade.net/fileadmin/user_upload/content/Nov08_SC_Members_public.pdf. Accessed 28 Dec 2008. Fairtrade Labelling Organizations International (FLO). 2008b. Product standards for hired labour. http://www.fairtrade.net/hlabour.html. Accessed 11 Jan 2009. Fantle, W. 2008. Cornucopia Institute’s complaints expose outlaw factory farms. Cooperative Grocer 134. http://www.cooperativegrocer.coop/articles/index.php?id=771. Accessed 17 Aug 2008. Fiser, J. 2007. Denial of certifying agent’s right to appeal upheld. The National Agricultural Law Center, Sept 27. http://www.nationalaglawcenter.org/assets/cases/mici2.html. Accessed 17 June 2008. Food and Drink Weekly. 2003. OTA launches campaign to roll back ‘redefinition’ of organic. March 17. http://www.thefreelibrary.com/OTA+launches+campaign+to+roll+back+redefinition+of+%22organic%22-a098945365. Accessed 19 Apr 2008. Hatamiya, L.S. 1997. Proposed organic standards. Informational memorandum for the deputy secretary, USDA, 1 May. http://www.motherjones.com/news/outfront/1998/05/usda_doc1.html. Accessed 16 Nov 2008. Ikerd, J. 1999. Organic agriculture faces the specialization of production systems; specialized systems and the economical stakes. Paper presented at Colloques de l’INRA, Lyon, France, 6–9 Dec. http://web.missouri.edu/ikerdj/papers/france.html. Accessed 3 Sept 2007. Kavilanz, P.B. 2008. The high price of going ‘organic’. CNNMoney, 23 Apr. http://money.cnn.com/2008/04/23/news/companies/organics_backlash/index.htm?postversion=2008042314. Accessed 29 June 2008. Lavigne, P. 2006. Is organic food the real deal? The Dallas Morning News, Jul 17. http://www.dallasnews.com/sharedcontent/dws/dn/latestnews/stories/071606dnccoorganics.19c550e.html. Accessed 2 June 2008. McKinney, M. 2007. Was Target’s organic milk just regular? Minneapolis Star Tribune, September 29. http://www.startribune.com/business/11225536.html. Accessed 23 Apr 2008. Myers, S. 2008. The organic factor: Does organic certification equate to better quality production? Natural Products Insider, January 2. http://www.naturalproductsinsider.com/articles/2008/01/the-organic-factor.aspx. Accessed 10 Feb 2008. Novak, C. 2008. Can Wal-Mart do ‘local’? The retail giant is using in-state farmers in an attempt to soften its image. U.S. News and World Report 24 July. http://www.usnews.com/articles/business/economy/2008/07/24/can-wal-mart-do-local.html. Accessed 28 Dec 2008. Organic Trade Association (OTA). 2006. The Organic Trade Association 2006 manufacturer survey overview. http://www.ota.com/pics/documents/short%20overview%20MMS.pdf. Accessed 2 June 2008. Organic Trade Association (OTA). 2007. The Organic Trade Association 2007 manufacturer survey overview. http://www.ota.com/pics/documents/2007ExecutiveSummary.pdf. Accessed 28 June 2008. Rogers, T. 2004. Small coffee brewers try to redefine fair trade. Christian Science Monitor, April 13. http://www.csmonitor.com/2004/0413/p01s02-woam.html. Accessed 5 June 2008. Scowcroft, B. 2006. The organic conversation begins anew (again). Greenmoney Journal 15 (2). http://www.greenmoneyjournal.com/article.mpl?newsletterid=39&articleid=505. Accessed 23 Mar 2008. Wal-Mart. 2006. Illinois’ Frey farms teams with Wal-Mart to celebrate America’s farmers (press release). 27 Sept. http://walmartstores.com/FactsNews/NewsRoom/5985.aspx. Accessed 28 Dec 2008. Wilson, S.J. 2007. Nonorganic ingredients get tentative OK. Los Angeles Times 23 June. http://articles.latimes.com/2007/jun/23/business/fi-organic23. Accessed 2 June 2008. Wolcott, J. 2002. An end to organic confusion? The Christian Science Monitor 16 Oct. http://www.csmonitor.com/2002/1016/p15s02-lifo.html. Accessed 2 June 2008.